A lion with myoclonus, involuntary muscle spasms, brought on by canine distemper virus infection during a 1994 outbreak. Credit: Serengeti Carnivore Disease Project. (Phys.org)—A study conducted by an international team of researchers has led to evidence that suggests lions in Africa originally got distemper from domesticated dogs, but now it appears there are other unknown carriers. In their paper published in Proceedings of the National Academy of Sciences the team explains the data analysis they undertook covering distemper infections in a park in Tanzania, and how their findings help better understand how infectious diseases jump between species. 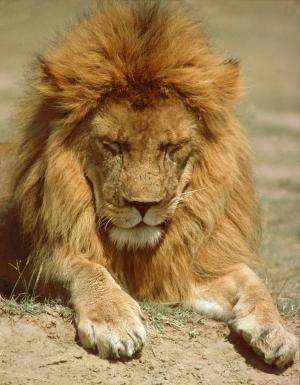 Back in 1994, 30 percent of the lions living in Serengeti National Park died from an outbreak of distemper, which came as quite a shock to park managers—until then it was believed that cats could not catch the disease, which is normally associated with dogs. A domestic dog vaccination program was subsequently implemented to curb the spread of the disease, which met with great success—in the dogs—outbreaks continued in lions, though it is now less deadly for them, but it has caused biologists to wonder if another animal might be involved in the dispersal of the disease. Distemper, caused by the canine distemper virus (CDV) is a viral disease and has been known to infect dogs, coyotes, foxes, pandas, and a wide variety of other animals, including big cats. It is transmitted through the air, and symptoms generally include a high fever, inflammation of the eyes and nose, and coughing, which is how the disease is spread. Scientists are hoping to learn more about how the disease is transmitted as part of an overall effort to prevent the loss of life wild animals that could lead to extinction in populations already threatened by the encroachment of man. In this new study, the researchers collected serological data obtained from lions in the park between the years 1984 to 2014, and for domestic dogs for the period 1992 to 2012 and then compared the outbreak timelines between the two species. They found that while it appears clear the initial infections in lions came from the domestic dogs, subsequent spikes in lion infections did not—suggesting another species is likely involved. The researchers believe more studies need to be carried out to determine which species that might be. The fear is that it is likely a roving animal such as the hyena, which would mean the virus could spread far and wide very easily. A young child holds a puppy for examination during a CDV vaccination campaign. Credit: Serengeti Carnivore Disease Project. Morbilliviruses cause many diseases of medical and veterinary importance, and although some (e.g., measles and rinderpest) have been controlled successfully, others, such as canine distemper virus (CDV), are a growing concern. A propensity for hostswitching has resulted in CDV emergence in new species, including endangered wildlife, posing challenges for controlling disease in multispecies communities. CDV typically is associated with domestic dogs, but little is known about its maintenance and transmission in species-rich areas or about the potential role of domestic dog vaccination as a means of reducing disease threats to wildlife. We address these questions by analyzing a long-term serological dataset of CDV in lions and domestic dogs from Tanzania's Serengeti ecosystem. Using a Bayesian state–space model, we show that dynamics of CDV have changed considerably over the past three decades. Initially, peaks of CDV infection in dogs preceded those in lions, suggesting that spill-over from dogs was the main driver of infection in wildlife. However, despite dog-to-lion transmission dominating cross-species transmission models, infection peaks in lions became more frequent and asynchronous from those in dogs, suggesting that other wildlife species may play a role in a potentially complex maintenance community. Widespread mass vaccination of domestic dogs reduced the probability of infection in dogs and the size of outbreaks but did not prevent transmission to or peaks of infection in lions. This study demonstrates the complexity of CDV dynamics in natural ecosystems and the value of long-term, large-scale datasets for investigating transmission patterns and evaluating disease control strategies. In reading years ago, it was stated that canine distemper arose in cats and was then transferred to dogs. This is known info. We had some colony cats that were hanging around get it and it did them in quick too. I had to bury two semi-feral female adults and 3 kittens about six months ago due to it. They got it and all died in about 4 days.